How do you live well when the physical foundation of your life is crumbling? This is the challenge for millions who live with diseases for which there is no cure. These incurable ailments produce a life of constant pain, fatigue, numbness, dizziness, and other debilitating symptoms that create chronic suffering. How do you live well when the physical foundation of your life is crumbling? This is the challenge for millions who live with diseases for which there is no cure. These incurable ailments produce a life of constant pain, fatigue, numbness, dizziness, and other debilitating symptoms that create chronic suffering. Can you thrive in life while experiencing the suffering persistent sickness provokes? 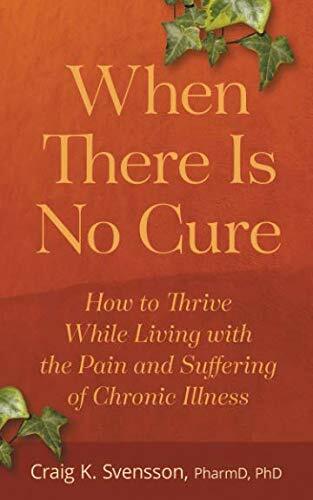 In When There Is No Cure, Dr. Craig Svensson guides readers to a path of thriving when life’s journey includes an incurable ailment. Drawing on his expertise as a pharmacist-scientist, as well as a fellow sufferer with several incurable diseases, he helps patients steer through the twists and turns of life with chronic illness.